08: How can I make all files in a folder, or all files in all recursive folders Elevated, Blocked, or Allow & Log? There are two methods to Elevate, Block or Allow&Log multiple files and folders. Method 1: Using FILE TYPE.. 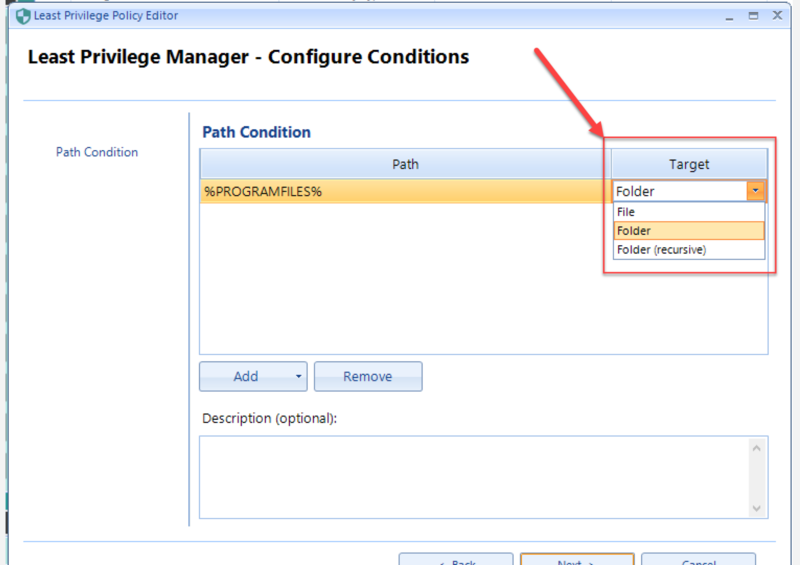 The ‘Folder’ path condition only applies to all files in the specified folder. The ‘Folder (recursive)’ path condition applies to all Descendant files. 02: PolicyPak Least Privilege Manager: How do I elevate single line commands (second batch file method)? 03: How do I setup SecureRun when there are so many variables and still ensure my rules work no matter what version of the software I have I installed? 04: When PolicyPak SecureRun(TM) is turned on, PowerShell won’t run. How can I re-enable this? 05: What is the supported list of BLOCKED script types for PolicyPak SecureRun™ ? 06: Does PolicyPak Least Privilege Manager block Macro attacks? 07: Can I use PolicyPak Least Privilege Manager to LOWER / remove admin rights from Administrators from an application or process, like Internet Explorer? 09: I elevated an application, but drag and drop between the elevated and other non-elevated applications isn’t working anymore. What can I try? 10: How to elevate Print driver installation using PolicyPak Least Privilege Manager?